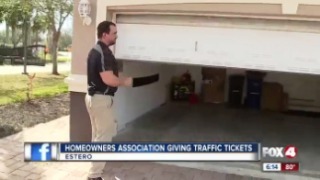 ESTERO -- A man is questioning the legality of his home owner's association citing him for an alleged traffic violation. This happened at the Timberwalk community off Three Oaks Parkway. Michael Krill told 4 In Your Corner he received a letter from his home owner's association, fining him $100.00 for rolling through a stop sign in the community. The letter had no picture or video evidence, only a photo of Krill's garage, which is a few feet away from the stop sign. He said he's never heard of his HOA giving out traffic citations and is concerned it is not legal. "It says a gray Ford Fusion rolled through a stop sign. There's not a license plate, just a picture of my garage which is right there." he said. "How are they enforcing this? Who is training them to give them the ability to give citations for rolling through stop signs supposedly." 4 In Your Corner asked neighbors if they were familiar with the policy. They were also confused. "I would think you would have to show proof. I would think a police officer would have to give the citation," said one neighbor. 4 In Your corner wanted to investigate the legality of the practice. We consulted with Richard DeBoest, who practices community association law with Goede, Adamczyk, DeBoest & Cross. He said HOA's are allowed to do this. "They not only have the authority, they have the duty to enforce the rules and one of them would obviously be follow the traffic control signs, stuff like that." he said. DeBoest said the practice is legal under the Florida Homeowners Association Act, but Krill can deny it. "If the board is aware of other people going through the stop sign and not stopping, and did not take action against them, that's what's called selective enforcement and could be a viable defense." 4 In Your Corner reached out to Timberwalk's HOA for their side to the story. They did not provide an on the record statement, but said they would look into the matter. Krill reported his HOA called him shortly after our call, and told him they would remove the fine.